Align your IT infrastructure withthe demands of your customer base. Finding a technology partner that understands your customers is crucial to success. 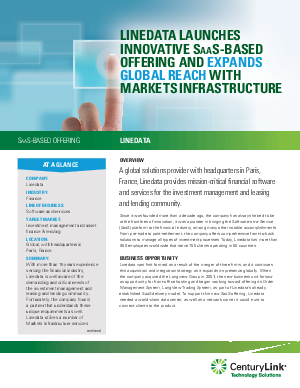 When Linedata, a financial software and services provider, launched its new SaaS offering, it needed a world-class data center, and a trusted network carrier to connect clients to the product. But serving clients in the investment management and leasing and lending markets, Linedata knew it was also critical that their partner understand the unique and demanding requirements of the financial industry. After evaluating numerous vendors, Linedata chose CenturyLink Technology Solutions – which had everything it needed and more. CenturyLink met all three of Linedata’s core criteria, having strong security compliance, a reliable global network and a deep understanding of the financial industry. CenturyLink’s global presence allowed Linedata to better serve its international clients and improve response times, while providing highly secure global connectivity to support the demanding nature of their clients’ business. With a customer support team dedicated entirely to the financial vertical, CenturyLink was exactly the kind of partner Linedata wanted to work with to launch their new product. “From the start, CenturyLink demonstrated a strong understanding of the financial services market – we knew this wasn’t your average hosting and colocation provider,” says LinedataHosted Infrastructure Director, Toby Battell. Since partnering with CenturyLink, Linedata has increased recurring revenue. With a hosted environment, they can now reach a whole new subset of potential customers in addition to offering existing customers an expanded suite of options.